Heads Up Music celebrates its 3rd Anniversary on Record Store Day! On Saturday April 13th , Record Store Day will mark its 11th anniversary as a world-wide celebration for independently-owned record stores and the unique culture that surrounds these distinct retail spaces. 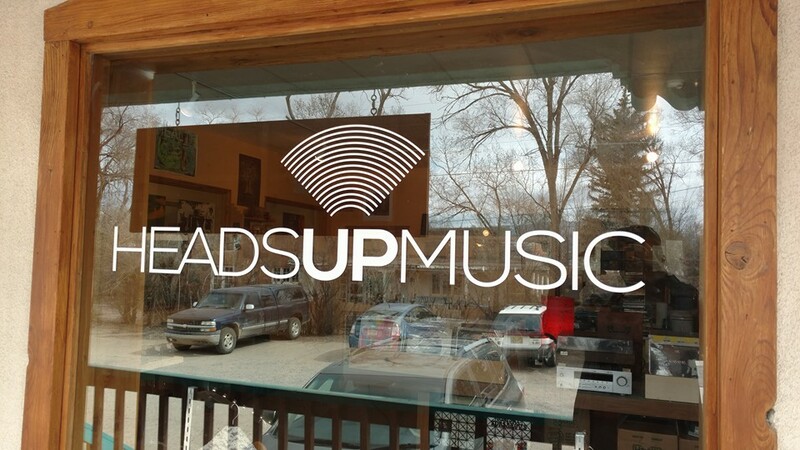 If you’re looking to catch one of these celebrations this year, Taos’ very own Heads Up Music (HUM) store is our official host for this annual event. Festivities include an overwhelming list of local bands and DJs performing throughout the day. Clam Canyon, Zephaniah Stringfield, Article15, Irksome Jazz Trio, and David Costanza are just some of the featured artists to look forward to at this event. You can also expect over 100 exclusive releases on new and used vinyl records throughout the day. Indeed it’s not by chance that Record Store Day occurs just 2 weeks after HUM’s own anniversary, since their opening in 2016. Since the inception of HUM, Mark and Stephanie have always been intent on carrying on the traditions of Record Store culture. Their store’s dual celebration with Record Store Day is a nod to their deeply-shared appreciation for all forms of tangible, physical media that you can touch, as well as the personalized and intimate atmosphere record stores offer to the communities they serve. “We made it 3 years because of support from the Town of Taos and all of our wonderful visitors. It takes all of us to keep a store like this alive. We definitely appreciate everyone,” says Mark. 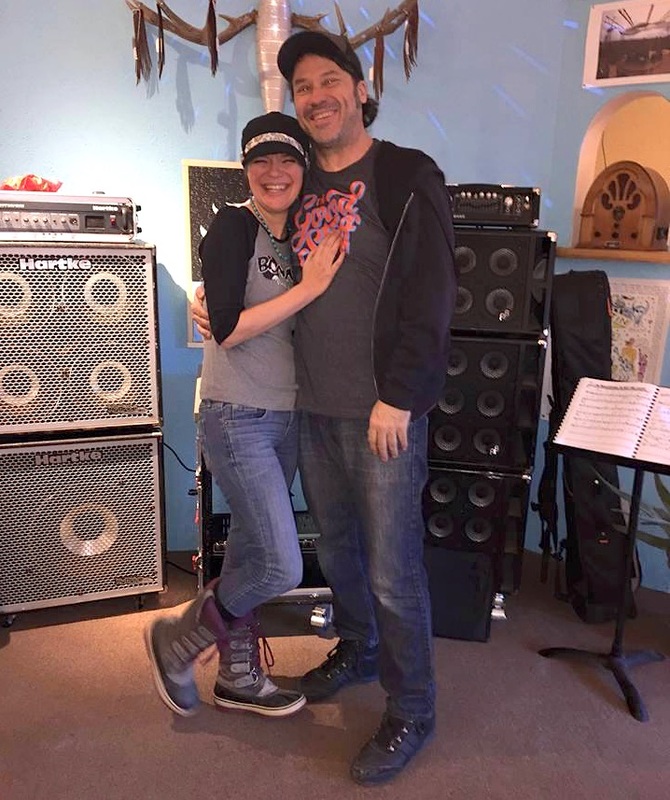 Both Mark and Stephanie brought their experiences in the music business to the Taos scene; most notably from Austin, Texas, where Mark was a retail buyer at the renowned Waterloo Records. “I’ve always had the dream of owning a record store. 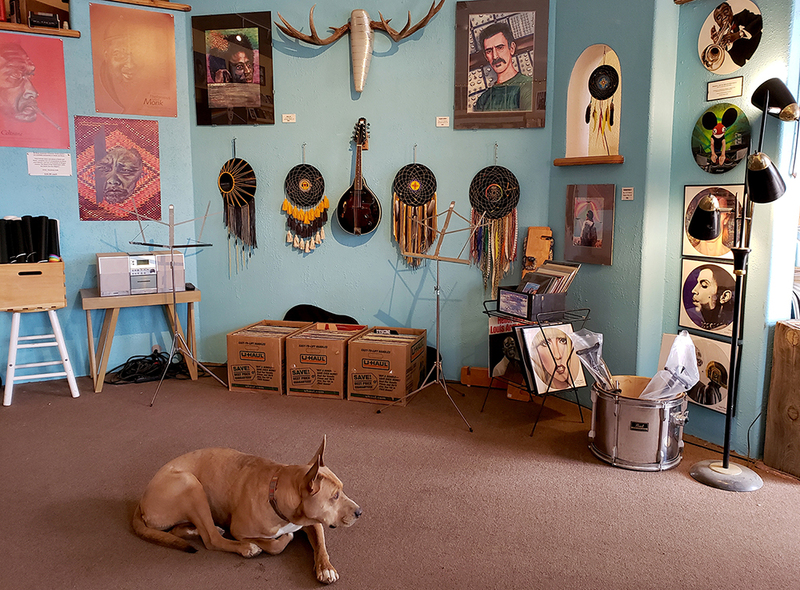 Taos provided me the opportunity to finally do for myself what I’ve done for others for so many years.” Oddly enough, not long after the two of them moved here, the long-established and beloved local music store Que Pasa announced they were closing their doors. Many Taoseños may fondly remember that the woman-owned Que Pasa was in business for over 30 years. Art wall at HUM with shop dog Abby waiting to greet the next customer! For anyone out there who hasn’t visited Heads Up Music yet, Mark urges you to “Come check us out! We offer a personalized, verbal, hands-on experience that you can’t get shopping online.” If you’re into physical media such as records, CDs, tapes, and the like, they have a wide variety of genres to choose from. You can even listen to some of the products at the record kiosk — headphones provided! Who knows, maybe you’ll spark up a conversation with another music aficionado next to you. The store also carries a selection of musical instruments, supplies, and accessories for personal and professional use. If there’s anything you need, Mark says, “We’re here to listen to the community. 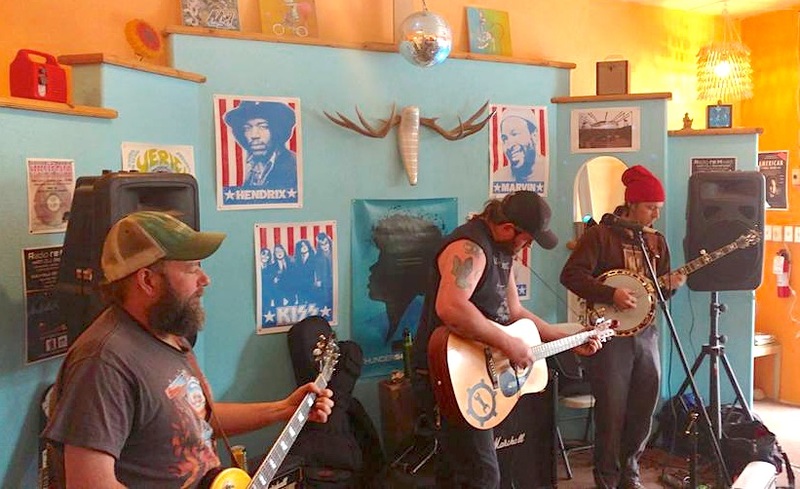 We can special order any kind of music supplies or products for you and get it to you for the best price.” And of course, what would any Taos store be without an eclectic selection of art and merchandise created by local artists? You can find music-themed memorabilia, jewelry, posters, T-shirts, and even home décor items for all the music lovers in your life. 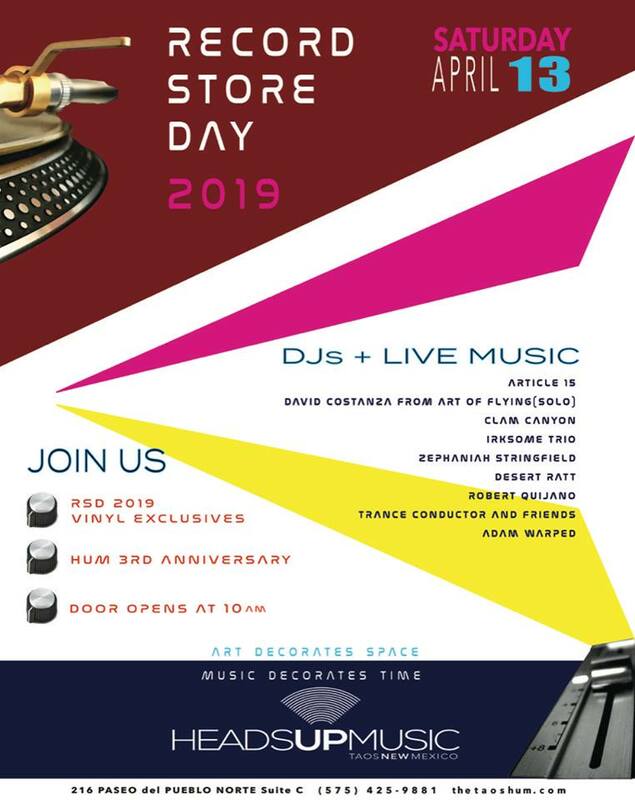 Visit Heads Up Music Store when you can, and mark your calendars for their big event: Record Store Day on Saturday April 13th 2019. The full music schedule has been released on their Facebook event page: click here. The day kicks off at 10AM and music will go on past sundown — or, if things are really successful … until the cops get called! Happy Anniversary to Heads Up Music and a big congratulations to Mark and Stephanie for another year in business. Now let’s party! See you there, Taos. Girl Wunder is a guest author for Live Taos. Do you have something interesting to say? Submit your article to [email protected] and we'll take it from there.